Hundreds of satisfied clients atest to the skill and care given to them during the sale or purchase of their Southern California residential and investment properties. Be sure to visit Jon and Bonnie's Client Testimonial Page to read what their customers say about them. With over 30 years of combined Real Estate sales experience Jon and Bonnie are the agents to contact whether your plan is to buy or sell real estate. Jon and Bonnie recognize that each client has a unique set of circumstances, and their vast experience in real estate transactions is the most valuable resource a buyer or seller can rely on in todays fast paced market. 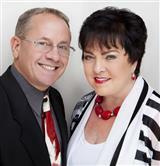 Jon and Bonnie have a unique Team Approach to selling real estate which assures that one or both of them are always available to their clientele. Well over 90 percent of their annual business volume comes from past clients and referrals... evidence of jobs well done. Understanding the importance of cutting edge technology, they are linked to global resources which offer your home worldwide exposure including video of your home on the internet when it comes time to sell. As market watchdogs, they'll advise you of the newest, hottest listings when you're buying to assure you the best of the best homes to consider. Jon and Bonnie welcome the opportunity to discuss your real estate needs. They develop ongoing, long lasting relationships with their customers and they look forward to meeting you. Call or e-mail Jon and Bonnie today. Imagine the possiblities!